Join with us for our Lent Quiet Day on 9th April 2019 at the St Benedict’s Centre. The day will begin with a short introduction to Lectio Divina, a contemplative, prayerful reading of the Bible. Then there will be a reading of selected scripture followed by personal quiet time for reflection, listening and prayer. 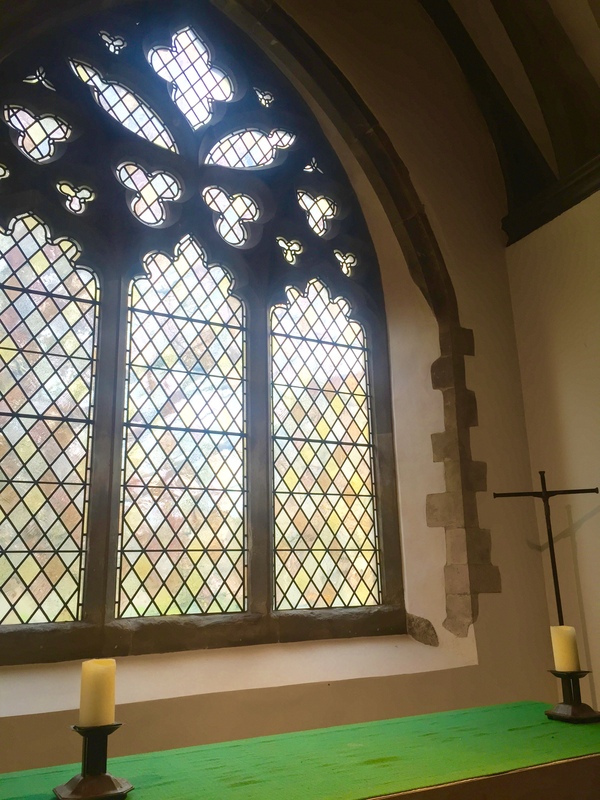 Following lunch (please bring a packed lunch) there will be another reading of selected scripture followed by personal quiet time culminating in joining with the Benedictine Community at Malling Abbey for the daily office of None- a short service of prayer and reading. If you would like or need to experience stillness and quiet during this Lent period to rest, reflect, listen and pray then you are most welcome to join with us. ‘Splendour Remains’ is a creative quiet day for all the artists and art enthusiasts among us. ‘Splendour Remains’ is a stunning piece of art created by Brighton based artist, Nicola Rose. This creative quiet day in April will focus on the artists experience in creating the work and the art owners experience in responding to it. This piece is owned by Rev Matthew Buchan who will be leading us through the day. There will be opportunities for personal reflection and quiet time as well as an opportunity to create a piece of art in Nicola’s style. Materials and refreshments are included in the cost- £25 and spaces are limited to 20. ‘Reflections of Malling’ will be taking place on Saturday 16th and Sunday 17th March 2019 in the Guest House here at the St Benedict’s Centre. Nicola Rose is a wonderful artist who has painted 20 churches from across Malling Deanery and they are simply stunning. The exhibition is free entry and all are welcome. This would be a lovely day out for church groups and communities and a wonderful opportunity to visit the St Benedict’s Centre if you’ve not been before. Light refreshments will be provided. Please do spread the word and invite your friends and family. Sadly, we are postponing our July creative quiet day ‘Splendour Remains’ and our art exhibition planned for September due to illness. However, we are postponing not cancelling and we’re super excited to have these two events take place here at the St Benedict’s Centre. We are so sorry for any inconvenience and disappointment this may have caused. Please do stay connected with our Facebook, Twitter and Programme page here for updates regarding the new dates and for news on our other upcoming events. We are so excited to announce that in July we will be having a creative quiet day for all the artists and art enthusiasts among us. ‘Splendour Remains’ is a stunning piece of art created by Brighton based artist, Nicola Rose. This July creative quiet day will focus on the artists experience in creating the work and the art owners experience in responding to it. This piece is owned by Rev Matthew Buchan who will be leading us through the day. There will be opportunities for personal reflection and quiet time as well as an opportunity to create a piece of art in Nicola’s style. Materials and refreshments are included in the cost- £25 and spaces are limited to 25. Join with us for ‘Be Still’ a day of space and reflection at the St Benedict’s Centre led by Tracey Jones, Centre Manager of the St Benedict’s Centre and Theology graduate (BTh Hons) of The Queen’s University of Belfast & Belfast Bible College. The day will be an opportunity to focus on what it means to be still, dwell, abide and have space amongst the busyness and oftentimes stress of our daily lives. There will be space for reflection, prayer and fellowship. Refreshments (tea/coffee/biscuits) will be provided. You will need to bring your own lunch or you can easily access lunch in West Malling (a short 2 min walk). Please do join with us for a day of reflection, stillness, and rest- you are welcome! On Tuesday 20th February 9.30am-1pm we are hosting a training day on Modern Slavery at the St Benedict’s Centre. This is part of the Diocese of Rochester Freedom from Slavery Campaign and will be delivered by the Gangmasters and Labour Abuse Authority. Modern slavery is a growing concern and reality in the UK, where there are at least 13,000 victims, although the National Crime Agency have suggested they believe that figure to be the tip of the iceberg. The Clewer Initiative has been set up by the Church of England to help dioceses to raise awareness of modern slavery and provide care and support to the victims. As part of that work the Diocese of Rochester and The Clewer Initiative will be running training on spotting the signs of modern slavery, with expert input from Lys Ford, a Partnerships Officer from the Gangmasters & Labour Abuse Authority. You will learn what kinds of modern slavery happen in the UK, how you can spot the signs, and who you should report your concerns to. Modern slavery is a global problem and international crime, affecting millions of people worldwide, including many victims within the UK. The training is FREE, but booking is essential as places are limited early booking is recommended. Our ‘Remembering God; Faith in a Time of Dementia’ event is coming up soon and we would love for you to join with us for a day which is sure to be a rich resource for those who attend. When we can no longer remember God, will God remember us? And if so, how might we be called to respond? The purpose of this day is to explore what it means to be a Christian at a time when the number of people living with dementia is rising rapidly. This one-day workshop is for those who are looking for tools to guide their prayer, thinking and ministry, and whose faith has been stirred or challenged by their encounter with people with dementia. Led by James Woodward; Principal of Sarum College and Coordinator for the Centre of Human Flourishing and Julia Burton-Jones; a Dementia Specialist Project Officer working within the Mission and Community Engagement team within the Dicoese of Rochester. Spaces are being snapped up so booking as soon as you can is advised. Join with us for ‘A Christmas Reflection’ a quiet day at the St Benedict’s Centre focussed on ‘Emmanuel, God With Us’. Led by Tracey Jones, Centre Manager of the St Benedict’s Centre and Theology- BTh (Hons) graduate from the Queen’s University of Belfast & Belfast Bible College the day will be an opportunity to consider what God being ‘with us’ really means for our daily lives. Refreshments (tea/coffee/biscuits) will be provided. You will need to bring a packed lunch or you can easily access lunch in West Malling. Please do join with us for a day of peace, stillness and hope- you are welcome. Please do check out our wonderful ‘Christmas Crafts & Carols’ day coming up at the St Benedict’s Centre on Thursday 7th December, led by the amazing Margaret Wooding-Jones- we are super excited!!! Do come along and bring your friends and family too- it’s going to be a great day of festive gifts and craft making, we’ll be having lots of tea/coffee and chat, some carol singing and mince pies to top it all off (there may be a goodie bag as well!). All refreshments & materials are provided…just bring yourself (and anyone else!) a packed lunch and come along for a fun and relaxed day in the beautiful surroundings of the St Benedict’s Centre and Malling Abbey. ‘Unlocking the Psalms with Simon Stocks’ is a 4 week series, open to all, at the St Benedict’s Centre in November 2017 diving into the Psalms exploring their purpose and meaning, and how they are relevant to us today. Join with us as we go deeper and grow together.